Today I will talk about minimizing costs when investing. Every fund has management fees, which are used by the investment firm for daily operation of the fund. These fees are called expense ratios, and they represent a percentage of the assets in your fund. Let's say your fund has an expense ratio of 0.5%. This means that 0.5% of your fund's total assets will be used by your investment firm to cover their expenses. The expense ratio lowers your return because it is taken out of your fund's assets. For every $10,000 you have invested, the firm is keeping $50. This may not sound like a lot, but the costs really add up over time. This figure shows that if you choose a fund with an expense ratio that is 1% less than a more expensive fund that performs the same, you can save up to several hundred thousand dollars over a 30 year period of compounding. 1% in extra fees may reduce your available retirement funds by 10 years. Some funds charge a 12b-1 fee, which is basically an extra operational expense used for advertising and promotion of the fund. This 12b-1 fee is included in the fund’s expense ratio. It is usually between 0.25 to 1%, with up to a maximum of 0.25% paid to brokers as a sales commission. The 12b-1 fee is just an extra fee that does nothing to enhance the performance of a fund. If you are paying an average expense ratio of 0.19%, and investing for a period of 30 years for retirement, you end up paying 5.7% in fees. If you are paying an expense ratio of 1.2% for 30 years, you lose over 30% of your investment to fees. As I’ve shared in my previous post, a load is basically a commission paid to agents, advisors, or brokers who sell you a fund. If you are working with a financial advisor, you likely have funds that have loads. Loads can be applied on the front end (A shares), back end (B shares), or ongoing (C shares). No matter how they’re called, all load funds charge a commission on the money you invest. The trouble with paying loads is that when you invest through an agent or advisor, you’re making him or her richer, whether or not their funds are making you richer. Historically, there is no real difference between performances of load funds versus no-load funds. In fact, according to Morningstar, no-load funds have actually performed better than load funds over the last 5-year period. This is even when you exclude the load fees that drag down your investment performance. Yes, no-load funds have consistently outperformed load funds. Don’t pay for any loads! With a no-load index fund, all of your money is put to work for you. With a load index fund, 4% to 6% of your money goes into the brokerage firm’s pocket before it gets invested for you. With active funds, the fund managers need to do heavy research into every stock before investing. This requires time, patience, dedication, and extra fees to compensate fund managers. Active managed funds can charge investors up to 2% in fees and more. Fund managers are actively picking and choosing which stocks and/or bonds are going into a mutual fund. They need control of their emotions whether to hold a stock when its value is dropping, or whether to start chasing returns of a stock if its value is improving. Passive funds simply aim to match an index (such as the total stock market, total bond market, or international stock market). Because passive funds don’t require active management, they are much cheaper to operate. Passive index funds aren’t trying to beat the market, they are simply trying to duplicate it. Passive funds try to get the average returns of the market. When passively investing in index funds, being “average” is not a bad thing. Over time, no other investment has returned the consistent gains of the stock market. The average expense ratio of all Vanguard funds is 0.19% while most actively managed funds charge an expense ratio of 1% to 2% (or more). The Vanguard Total Stock Market index fund (VTSMX) has an expense ratio of just 0.17% for investor grade funds. Admiral shares ($10,000 minimum) of the Vanguard Total Stock Market index fund (VTSAX) charges an expense ratio of just 0.05%. For the ETF version of the fund (VTI), Vanguard charges an expense ratio of just 0.05%. This is 95% lower in cost than the average expense ratio of funds with similar holdings. Studies consistently confirm that most actively managed funds do not outperform passive index funds. When the stock market is doing well, actively managed funds may underperform the average. When the stock market is doing poorly, actively managed funds may do worse than the average. These studies find that active fund managers are rarely consistent over long periods of time, and that most good performance winds down to just plain luck. According to Morningstar, only 38.5% of actively managed stock funds have beaten their benchmark indexes over the past 5 years. This is a sobering fact. Be careful of service fees that your investment firm may charge you. These are fees you may be paying to have your investment firm send you paper statements, annual reports, quarterly updates, etc. I was investing with Edward Jones for about 2 years and didn’t realize that I was being charged $40 a year for these service fees. When I switched to Vanguard, I was pleasantly surprised that they waived all service fees as long as I signed up for electronic paperless statements; no paperwork to clutter my mailbox and no extraneous fees. I choose to invest with Vanguard, because it is client-owned. This means that you, the client owner, own the funds that own Vanguard. This keeps costs as low as possible. Fund shareholders pay only what it costs Vanguard to operate the funds. There are never any sales commissions with Vanguard. There are no loads on any of Vanguard’s funds. The average expense ratio for funds at Vanguard is 0.19%, with the lowest expense ratio for a fund being 0.05%. Vanguard’s founder John C. Bogle is credited with the creation of the world's first index fund available to individual investors in 1976, the Vanguard 500 Index Fund (VFINX). When I first started investing a few years ago, a friend set me up with a financial advisor who worked with Edward Jones, an investment firm. I figured that I needed a financial advisor because I thought investing was complicated. My advisor made investing in my retirement seem very easy. All I had to do was set up direct deposit with the company and my financial advisor would do the rest. I was sold a mutual fund called MFS Growth Allocation Fund Class A (MAGWX) when I first started investing in retirement July 2010. Looking back, I can’t believe how much money I was throwing away by not taking investments into my own hands. The MAGWX is a class A fund, which means that the fees are front loaded. The front load is currently 5.75%!!! This means for every $1,000 investment contribution, $57.50 was going to Edward Jones and my broker’s pocket as payment for the “service of helping me pick a fund.” The expense ratio of MAGWX is a whopping 1.17%. While this may be a good fund (current year to date return is 7.47%), the fees on owning this fund really eat away at the returns. And to top it off (as I shared earlier), there was a $40 a year account service fee. It was only later that I learned about index fund investing with no commission, no-load, low cost funds at Vanguard. Armed with this information, I decided to leave Edward Jones and take investing into my own hands. I have nothing personal against Edward Jones; the firm has been designated with the “Highest in Investor Satisfaction” by J.D. Power and Associates in 2002, 2005, 2006, 2007, 2010, and 2012. It's just that most investors can be much more successful investing in index funds on their own rather than working with brokers and financial advisors. 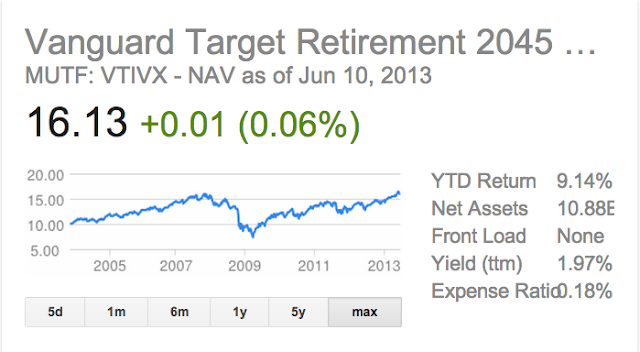 I joined Vanguard in December 2011 and the first thing I did was open a Target Date Retirement fund. 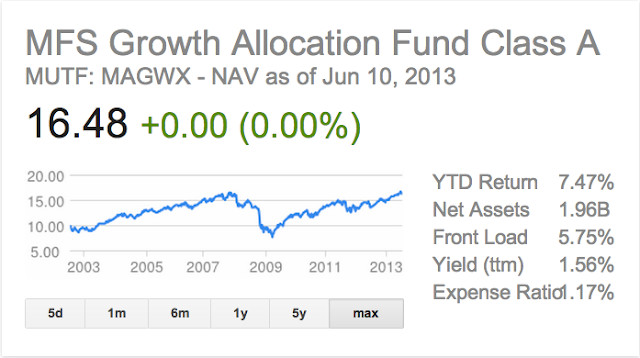 I chose the Vanguard Target Retirement 2045 (VTIVX), which I think is still a great beginner mutual fund. It is a fund of funds that contains an aggressive mix of stocks (90%) to bonds (10%). VTIVX is made up of 3 other Vanguard index funds: total stock market (62.7%), total international stock market (27.3%), and total bond market (10.0%). VTIVX has a current year to date return of 9.14%, has NO front load fees, no account management or maintenance fees, and an expense ratio of only 0.18%, which is 0.99% less expense ratio and 6.5x cheaper than owning my previous fund at Edward Jones (expense ratio 1.17%). Recently I have decided to take even more control of my portfolio and have decided to adjust my asset allocation individually. I am no longer holding VTIVX; I am holding the individual components of the target date fund, which allows me to have more control with even less fees. I will share the details of my personal investment portfolio in a future post. As it turns out, even the average person can achieve above average results by investing in mutual funds. The beauty of owning index funds is that you have reduced your investment risks by diversifying into hundreds or thousands of stocks / bonds. You don’t need to go crazy watching the market volatility of individual stocks everyday. You simply buy an index fund (or several), and you hold it and see its value grow over time. The lower costs associated with investing in index funds ensures that you will earn more money than investors who pay higher costs. You have better things to do with your time such as reading, traveling, or spending time with your significant other, family and friends. While we cannot control whether the stock market is going to surge or crash, we can control the amount of fees we pay to own mutual funds. By passively investing in index funds, you get to keep more of your money. And the more money you get to keep, the more you can invest. Am I invested in individual stocks or mutual funds? Am I invested in passive or active managed mutual funds? Do I pay any loads? What are the expense ratios that I am paying for? What are my account service fees? You may be surprised at what you hear and how many extra fees you are paying. Good news: you can easily transfer your investment account over to Vanguard; all it takes is a quick visit to www.Vanguard.com. You won’t be charged any fees to open an account with them. However, your previous investment firm may charge you an account cancellation fee. I know I was charged $40 when I left Edward Jones. Now if you haven’t started investing yet, now is the time. The best financial decision I ever made about investing was leaving Edward Jones and switching over to Vanguard. Note: If your company offers a 401(k) / 403(b) match, first contribute up to the match, even if the fund choices are expensive or mediocre. 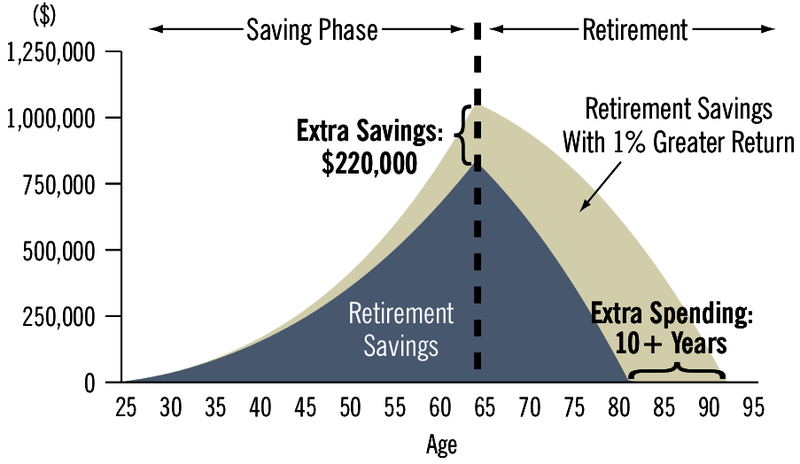 Then, you should max out your Roth or Traditional IRA contribution. You should also consider your 401(k) and your IRA as one complete portfolio. This way you can select the lowest cost funds for your 401(k) and complete your asset allocation with your IRA. I originally wanted this post to discuss lowering costs and taxes with investing, but that post would be too long. I will discuss tax efficiency on the next post in my investment series. That's it for today. Its not like way he said that Growing a bread can solve the financial problem! Every problem have an solution also and for that particular problem we need a particular solution as well. Like financial planner can resolve the financial problems. A good planner who have their diploma or graduate degree in that course are much more helpful for the planning prospects.